Except on those rare occasions where WEDNESDAYS are for book reviews because Sunday was taken up with more Disney jibber-jabber. We’ve all been hurt. Whether other people have hurt us or we’ve hurt ourselves, we can all relate to the pain of going through difficult times. 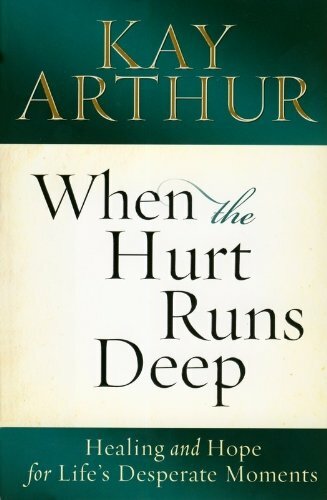 Kay Arthur has experienced this same pain in her own life multiple times, and with frank honesty and compassion, she shares in her newest book what the Bible has to say to us when the hurt runs deep. Mrs. Arthur’s book is, first and foremost, Scripture-intensive. She knows her Bible, and she constantly takes readers back to how God answers the questions that come from suffering, concentrating heavily on the stories of Job and Jesus Himself. The most impacting chapter to me was when she simply stated (and backed up with plenty of Scripture) that life changes but God does not. She never suggests that there are easy answers to our difficult questions about why bad things happen, but she affirms that there is a God who sees, knows, and understands all of our pain and heartache.